By Australian standards the Esperance region certainly has had a long history of maritime exploration. Early Dutch records from 1627 indicate that Pieter Van Nuyts first discovered the south western Australian coastline, sailing from Cape Leeuwin to offshore islands near present day Ceduna, in South Australia. Later maritime explorations of the Esperance area included those made by Captain Bruni D'Entrecasteaux in 1792. In charge of two French vessels - L'Esperance and La Recherche - D'Entrecasteaux was commissioned to search for a long vanished explorer named La Perouse. Whilst the search for La Perouse proved to be in vain, nevertheless valuable scientific discoveries were made, including compiling the world's first major collection of unique Western Australian flora. Esperance's long association with maritime exploration continued when Matthew Flinders made the first accurate charts of the Recherche Archipelago in 1802. In later years Esperance's waters were home to sealers and a host of itinerant whaling ships searching for valuable Right Whales. Land exploration of the Esperance region can be said to have begun in 1841. 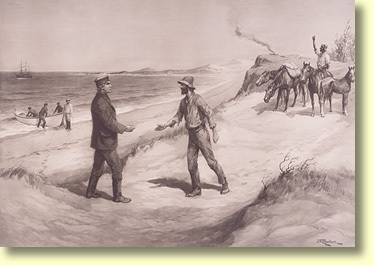 At the time Edward John Eyre and his aboriginal companion Wylie were involved in a do or die struggle to cross the Nullarbor, desperately hoping to reach the safety the King George's Sound settlement. Suffering from starvation and exposure, Eyre and Wylie nearly came to grief at nearby Lucky Bay. Good fortune was on their side however, and the pair were miraculously rescued by Captain Rossiter, the English master of a French whaling ship named the "Mississippi." Permanent European settlement of Esperance commenced with the arrival of the Dempster family from Northam in 1863. Accompanied by 500 sheep and 200 horses, the Dempster brothers were granted vast grazing leases encompassing all of present day Esperance. The Dempsters prospered and within a few years waves of pioneering graziers came flooding in, opening up the Salmon Gum country to the north, and later spilling over onto the arid lands of the Nullarbor. Western Australia's Goldrush of the 1890s saw Esperance rise to prominence as a commercial port with strong sea links to the eastern states. At the time Esperance served as transit point for thousands of gold diggers, and of its 1000 permanent residents, many were said to have originated from Adelaide. In time, production of Western Australia's Goldfields declined, and with it so too did Esperance's importance as a port. Compounding Esperance's decline was the controversial construction of a rail link between Perth and Kalgoorlie in 1897. From 1912 onwards, successive Western Australian governments promoted the development of a cereal growing industry. Plagued by poor soils however, Esperance's wheat belt proved to be a marginal economic proposition for many years. Throughout the depression years of the 1930s Esperance's farming community endured staggering bankruptcy rates approaching 75%. In 1949 salvation came to hand when the Esperance Plains Research Station discovered the wheat belt was deficient in phosphorous, and copper and zinc trace elements. Judicious top dressing of the soil with superphosphate and trace elements remedied the situation, and Esperance's farming community returned to profitability. When visiting Esperance, Nullarbor Net recommends your first port of call should be the Esperance Visitor Centre. Here visitors can obtain a copy of Experience Esperance's Booklet which will definitely assist assist you in navigating your way around Esperance - and moreover, give you an excellent idea of what the area has to offer. Accommodation and tour bookings can be made here. Esperance's Visitor Centre can be contacted by telephoning (08) 9083 1555 or faxing (08) 9071 4543. Email contact info@visitesperance.com. Website information about Esperance and the surroundings can be found at found at: www.visitesperance.com. Plenty of Sun, Sand, Surf, and WIND! TransWA operates an extensive network of bus services which link through to Perth, Albany, Norseman, Kalgoorlie and other towns on the Western Australian Goldfields. Services operate on a daily basis and bookings can be made with TransWA directly on 1300 662 205, or by calling the Esperance Visitors Centre on (08) 9083 1555. Buses stop at the bus station located on the corner of Dempster and Kemp streets. Esperance Visitor Centre also acts as an agent for Westrail. Skywest operates daily services between Perth and Esperance. Bookings can be made by calling them on 1300 660 088. Alternatively for online bookings and flight schedules visit www.skywest.com.au. Flights last for about 80 minutes or so. Skywest bookings can also be made at Esperance's Visitor Centre located in the Museum Village, on Dempster Street. Flight bookings can also be made at Skywest's Perth Offices. Below you will find a driving distance calculator for destinations in South Western Australia through to Perth from Esperance. The distances are meant to be used as a rough guide and readers should note that there are often many different route alternatives - hence possible variations compared to your actual chosen route. A really great resource for Western Australian route maps can also be found at theWA Royal Automobile Club. Definitely highly recommended! Pine Grove Holiday resort is located at 817 Harbour Road. Pine Grove offers 1 and 2 bedroom chalets suitable for up to 6 people. Budget Park Cabins suitable for 2 to 6 people are available and come complete with self cooking facilities. Quality 2 and 4 bedroom apartments are available and suitable for up to 10 people. Powered caravan sites can be hired, some with en suite facilities. Tent sites are also available. Other facilities include barbecues, camp kitchen and playground. Dogs are only permitted on camp sites. For bookings and further information telephone (08) 9071 4100 or fax (08) 9071 5100. Email contact pinegrove@acclaimparks.com.au. Esperance Bay Holiday Park (Top Tourist chain) is located at 162 Dempster Street. Esperance Bay Holiday Park offers 6 berth self contained chalets and park cabins. Powered caravan sites and camping facilities are also available. Other facilities include barbecues, a playground and TV Room. Dogs are not permitted. For further information telephone or fax (08) 9071 2237. Email contact esperancebayhp@westnet.com.au. Website information www.big4.com.au. 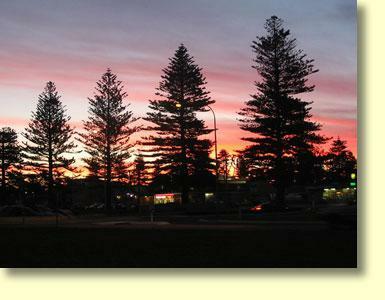 Esperance Seafront Caravan Park (Top Tourist chain) is located on Goldfields Road. Esperance Seafront Caravan Park offers fully self contained brick 3 bedroom holiday units. Covering 10 acres this Park offers 177 caravan and tent sites. On site caravans are also available for hire. Other facilities include camp kitchen, enclose patio adjacent to a delicatessen and a large barbecue area. Dogs are not permitted. Esperance Seafront Caravan Park is situated near the beach and a fishing jetty. For further information telephone (08) 9071 1251 or fax (08) 9071 7003. Email contact espseafrontcvp@wn.com.au. Website information: www.esperanceseafront.com. Bushlands Caravan Park is situated on Collier Road. Located 7 kilometres from Esperance this caravan park offers basic and well maintained cabins, along with powered and unpowered camp sites. Orleans Bay Caravan Park is situated on Wharton Road, 88 kilometres east of Esperance - on Duke of Orleans Bay. Orleans Bay Caravan Park offers chalets, park homes, and both powered and unpowered sites. Barbeucue facilities are available and dogs are permitted. Situated between Cape Le Grand and Cape Arid National Parks, this caravan park might well serve as a base to explore further afield. For further information please telephone (08) 9075 0033 or fax (08) 9076 6006. Esperance has a large number and variety of Hotel/Motel and Bed and Breakfast facilities. Travelers can expect prices to range from budget through to four star top of the range accommodation. Nullarbor Net suggests you contact the Esperance Visitor Centre to obtain further detailed information. Esperance Visitor Centre can be contacted by telephoning (08) 9083 1555 or fax (08) 9071 4543. Booking enquiries can be made at bookings@visitesperance.com. Regional Western Australia is home to many fine museums and Esperance's Municipal Museum is no exception. Esperance's museum has a diverse collection with displays covering the region's early pioneering history, maritime exhibits and farm machinery. A unique feature of the museum is the world's most comprehensive display of NASA Skylab memorabilia. Skylab was America's first space station and plummeted to the earth in 1979 - to the northeast of Esperance. While we're on the subject, Nullarbor Net wishes to take this opportunity to thank the U.S. taxpayer for funding this unique display! Well worth a visit, Esperance's Municipal Museum is open daily from 1-30 PM to 4-30 PM. For further information please telephone or fax (08) 9071 1579. Email contact esmuseum@bigpond.net.au . Esperance's Great Ocean Drive is a 38 kilometre ring road that takes the traveller past some of Australia's best coastal scenery. Unforgettable panoramic views of the Recherche Archipelago can be seen from Rotary Lookout. Dotted along the coast are a succession of exquisitely sculpted granite headlands and a string of white windswept beaches. Surfers can catch waves at West Beach and Twilight Cove offers itself as a fine swimming beach. 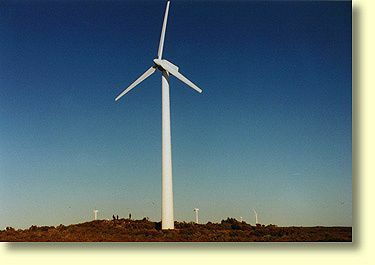 Nearby at 10 mile Lagoon and Salmon Beach travellers can get some close up views of Esperance's electricity generating wind farms. Returning to Esperance is Pink Lake, and when in colour this salt lake really is pink. Nullarbor Net really does recommend you spend a few hours on the Great Ocean Drive. 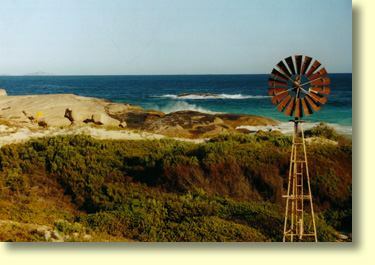 Cape Le Grand is located 56 kilometres east of Esperance. Travellers will find this national park studded with rugged granite headlands and beautiful bays such as Hellfire Bay, Thistle Cove and the very popular Lucky Bay. 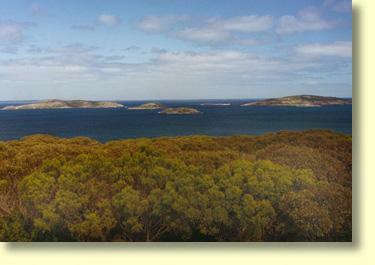 Straddling the coastline visitors will find bush walking trails with sweeping views to offshore islands. Those of you who enjoy fishing remote areas should note that boats can be launched from Lucky Bay. Located within the south western corner of the national park are a series of spectacular outcrops named Mount Le Grand, Frenchman's Peak and Mississippi Hill. Cape Le Grand is home to many unique species of native wildflowers and these can be seen in full bloom between September and November. Excellent caravan and camping sites can be found at both Le Grand Beach and Lucky Bay. Dogs are not permitted within the park however. Visitors should note that camping fees are charged in addition to park entry fees. Cape Le Grand National Park is definitely one of Australia's unique national parks. For further information please contact the Department of Environment and Conservation (DEC) by telephoning (08) 9083 2100 or alternatively view a local mud map and the area's local attractions at DEC's Cape Le Grand Website. 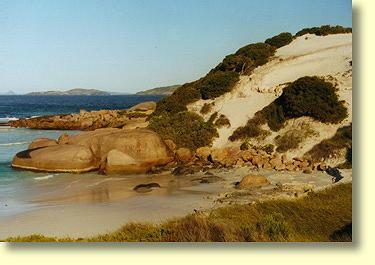 Cape Arid National Park is located 120 kilometres east of Esperance. 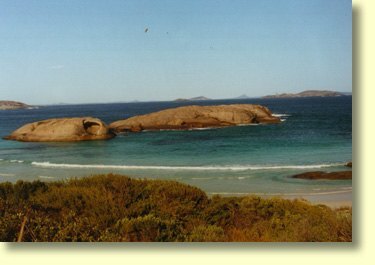 For travellers remote Cape Arid offers stunning coastal scenery, rugged granite peaks, excellent swimming , bushwalking and recreational fishing opportunities. Amongst bird watchers Cape Arid is known to be home to endangered Western Ground Parrots, and other rare species such as Carnaby's Black Cockatoo, the Cape Barren Goose and Australasian Bittern. Much of Cape Arid National Park is really only suitable for 4 wheel drive vehicles. Conventional vehicles can drive to Thomas River which is located in the south western corner of the national park. At Thomas River visitors will find camp sites overlooking Yokinup Bay. Nearby at Dolphin Cove and Tagon Bay, Southern Right Whales can sometimes be seen - usually between June and October. These areas can be accessed by walking trails as can nearby Lake Boolenup. Campers are advised to bring their own drinking water. When travelling to Cape Arid it is best to obtain local advice beforehand and Nullarbor Net recommends you contact Esperance's Department of Environment and Conservation Office (DEC) by telephoning (08) 9083 2100. DEC's Esperance office is located on 92 Dempster Street. Alternatively view DEC's Cape Arid Web Site. - this information would be of particular interest to birdwatchers and naturalists. With 140 granite islands and numerous rocky islets Esperance can rightly lay claim to being one of the top 10 diving sites in Australia. From a diver's perspective Esperance's waters offer excellent visibility. Within the Recherche Archipelago divers will find numerous granite walls, boulders, large caves and a couple of wrecks - the largest and most notable of the 2 being the Sanko Harvest at 174 metres long. Located 21 nautical miles from Esperance, the Sanko Harvest has broken up into 3 sections lying in 15 to 42 metres of water. A large number of shore dives can also be found in the Esperance area. For the casual diver the most accessible of these is an artificial reef located off the end of Esperance's Tanker Jetty. Divers should note the artificial reef is a no fishing zone. Aussie Bight Expeditions offer half day Beach Tours to Cape Le Grand National Park, and full day tours that take in both Cape Le Grand and Duke of Orleans Bay. During the wildflower season Aussie Bight Expeditions also offer 4 wheel drive half and full day Wild Flower Tours. For further information contact Aussie Bight Expeditions by telephoning 0427 536 674. Alternatively Email contact aussiebight@bigpond.com. Mackenzie's Island Cruises offer daily wildlife cruises around Esperance's Bay of Isles. A stopover is also made at nearby Woody Island where camping and eco tourism accommodation is available. Mackenzie's Island Cruises is located at 71 The Esplanade. For further information telephone (08) 9071 5757 or fax (08) 9071 4993. Email contact info@woodyisland.com.au. Website information can be found at www.woodyisland.com.au. Esperance Air Service offers 45 minute flights along Esperance's picturesque sapphire blue coastline. Flying in a Cessna 210 you can expect stunning views of Cape Le Grand, Luck Bay and the Islands of the Recherche Archipelago. This is certainly a unique way to view Esperance's Bay of Isles. Esperance Air Service can be contacted by telephoning (08) 9071 1467. Mobile phone no. 0418 912 210. Duke Charters & Tours also operate locally guided tours and can be contacted by telephoning (08) 9076 6157. Fuel price information for driving in the Esperance and Western Australian Goldfieds region can be viewed at Fuel Watch. This site is regularly updated and also covers metropolitan Perth and other areas in Western Australia. Also well worth a mention is ExplorOz's Western Australian and South Australian fuel price pages. Nullarbor Net recommends you use the update facilities on these sites to provide current pricing information for the benefit of other travellers.